For Austrian-born Alex Eberhard, George Harrison has always been a major musical inspiration and the creation of The All Things Must Pass Orchestra is the culmination of his passion to play George’s music live. He studied Classical Percussion, Jazz Drums and Guitar at the University of Music and Performing Arts in Graz, where he gained a Master's degree. In 2002, he relocated to the UK, where he quickly became established as a drummer on the Brighton jazz scene which is where he met many of the musicians involved in this project. Bernd Rest was also born in Austria and studied classical guitar in Salzburg before moving to England in 1991 to study jazz & contemporary music at Leeds College of Music and then musical composition at King’s College London. In the early nineties, he worked as a guitarist and songwriter with Brighton-based folk trio Ma Mood, has subsequently released several albums with his wife Rosie Brown and has also recently started collaborating with singer/songwriter Tim Keegan. Bernd works as Composer in Residence for the ARK education network, runs two school orchestras in Brighton, and has also composed scores for film and tv. 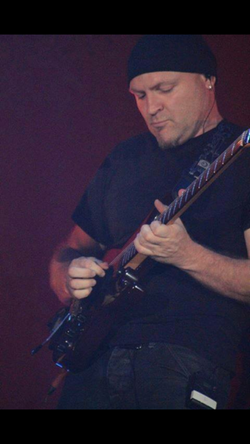 Totally at home in a jazz, rock, blues or soul environment, Tony has played guitar for numerous pop bands and performed at some of Britain’s biggest festivals and concert venues. He feels a great affinity with George Harrison's music and spiritual leanings, loves The Beatles and has a strong family connection to the City of Liverpool and its rich traditions. 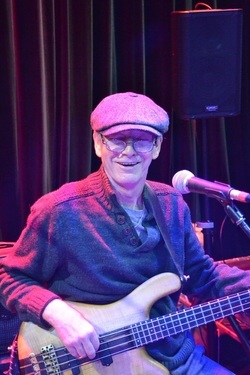 Dave Barnard’s long and varied professional musical career began in the late 1970s when he was signed to Polydor Records as a bass player, vocalist and songwriter. Throughout the 1980s and 1990s he continued his musical career as a renowned salsa specialist bass player, teaching this style at The Bass Institute in London for three years whilst playing club dates, cabaret shows and cruise ships. 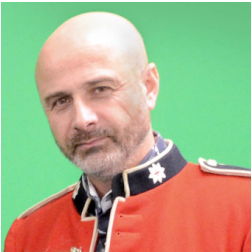 During the late 1990s to 2000s, Dave worked as SoundLive residential course leader for The Prince’s Trust. He has been a bass player and musical director for many touring US jazz artists and is perhaps best known for his work with the late singer/songwriter Terry Callier, with whom he toured and recorded for 18 years. 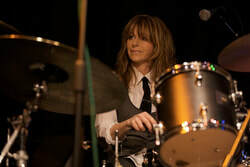 ​Trained as a classical pianist, Marianne then studied rock drumming at BIMM and jazz drumming at Chichester College. She has played with a wide range of bands and musicians including the legendary bass player Herbie Flowers, and the equally famous guitarist Chris Spedding. ​Marianne has taught at Herbie Flowers’ Rock Shops in Brighton, at the Dartington Summer School, and at Richard Stilgoe’s Orpheus Centre. 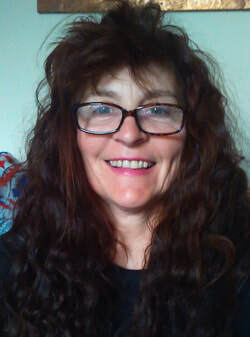 She has recorded albums at Richard Durrant’s Longman Records studio, and played for numerous shows under the musical direction of Michael Hinton and Ian White. Alumni of the renowned Guildhall School of Music & Drama and former member of The National Youth Jazz Orchestra, Imogen’s career has since encompassed several recordings, a three-year residency at London’s prestigious Dorchester Hotel and several tours of Europe, the Middle East and South Korea. Closer to home, she has performed at London's Jazz Café, 606 Club, Ronnie Scott’s Jazz Club and the Barbican Hall and has worked with many of the country’s finest jazz artists. Stella has had a long and eclectic career in music as a performer, vocal coach, choirmaster and promoter. Whilst studying Fine Art in Brighton in the late 70's, Stella joined punk band The Molestors. Her first gig was supporting Gong at Camden Palace and her first recording experience was doing a live session for John Peel radio show at Abbey Road studios. Moving to London to study at Goldsmiths College in the early 80's, she joined the rock band Another Fine Myth. She then formed a string of acappella groups, most notably The River Sisters, ran vocal workshops and a folk club in Deptford and booked musicians for The Eclectic Club at the White Swan Hotel in Greenwich, where she also played country blues guitar in several duos. ​Philippe grew up near Paris, playing blues harp and saxophone, listening to blues and jazz and eventually forming his own band. 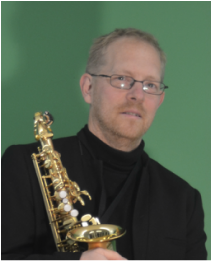 In 1990 he moved to Southampton to study Marine Biology, while becoming part of the local jazz and blues scene, and studying jazz with Ray D’Inverno. In 2006 he took a sabbatical to study jazz full time, eventually moving to Brighton when music became his major focus. He is now involved in soul, jazz, and funk bands, saxophone quartets, and big band and is a co-founder of Brighton’s Studio 9 Orchestra. ​Simon plays jazz piano, Hammond organ and keyboards as well as being a composer and arranger. 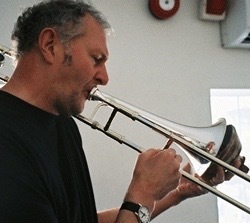 He teaches on the Jazz course at Chichester College and plays & contributes musically to a wide variety of ensembles, including the well-established funk band Oomphf.